CALGARY - WestJet Airlines Ltd.'s "best ever" quarterly earnings were overshadowed Tuesday by a drop in its stock, as investors worried whether the airline will be able to profitably fill its planes as it increases capacity. Shares in the airline fell by as much as 13 per cent on the Toronto Stock Exchange, but recovered later in the day to close down $1.85 or 7.5 per cent at $22.87. The airline posted a first-quarter profit Tuesday of $91.1 million, or 68 cents per share, during the first three months of 2013, up from $68.3 million, or 49 cents per share, in the same 2012 period. The earnings beat the 63 cents per share analysts polled by Thomson Reuters had been expecting, while total revenue was up 8.6 per cent at $967.2 million, from $891 million a year ago. However, the airline also reported that its load factor — a measure of how full its planes are flying — fell 3.5 percentage points to 82.7 during April, compared to the same month a year earlier. CEO Gregg Saretsky attributed the industry-wide "soft-patch" to the Easter and Passover holidays falling earlier than usual this year. WestJet said it expects to grow its system-wide capacity by between nine and 10 per cent during the second quarter, and by 7.5 to 8.5 per cent for the year. "So investors are thinking, 'Well, your load factor is falling, but you've got this huge amount of capacity growth. Are you going to be able to fill that capacity profitably?'" said Robert Kokonis, president of aviation consulting firm AirTrav Inc.
Saretsky said last year, the airline ran its planes too full, giving up customers it could have snagged, had there been more capacity. He added that the capacity WestJet is bringing to the market should enable the airline to still generate a sustainable 12 per cent return on invested capital. "We're putting a little bit of our foot to the accelerator because of the continued strong macroeconomic environment and the results that we're enjoying," he said. Kokonis, who believed the stock market reaction was overdone, said WestJet's management has a proven track record, the Canadian economic outlook is good and the airline has partnerships with international carriers to bring more traffic into its system. "This has created a bona fide buying opportunity because that team is taking this company in the right direction," Kokonis said. National Bank Financial analyst Cameron Doerksen said he's not too worried about the dip in revenue per available seat mile WestJet expects in the second quarter. "We are not concerned given that WestJet's growth is aimed at profitable market share gains, that competitive capacity growth is rational, and based on forward bookings and our own weekly fare surveys, that demand for air travel still remains steady," he wrote in a note to clients. Also Tuesday, WestJet said it has signed a deal to update its fleet by selling 10 of its oldest jets and replacing them with 10 newer ones. The airline said it has signed a deal to sell 10 of its oldest Boeing 737-700 aircraft to an unidentified buyer and agreed to buy 10 Boeing 737-800 aircraft in 2014 and 2015. The airline also deferred the delivery of five Boeing 737-700 aircraft from 2014 and 2015 to 2016 and 2017. In February, WestJet announced that its new WestJet Encore service will start in June with service from Calgary and Vancouver to Fort St. John, B.C., and from Calgary to Nanaimo, B.C. On Monday, Transport Canada granted WestJet an exemption to allow the airline to use a ratio of one flight attendant for every 50 passenger seats onboard an aircraft. Regulations currently require one flight attendant for every 40 passengers on board an aircraft. However, for certain aircraft configured with up to 50 passenger seats, only one flight attendant is required. 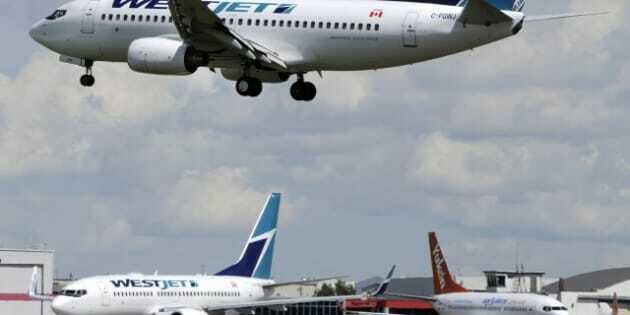 Transport Canada said the exemption brings WestJet in line with other international standards including airlines based in the United States that fly to and from Canada with the same ratio.